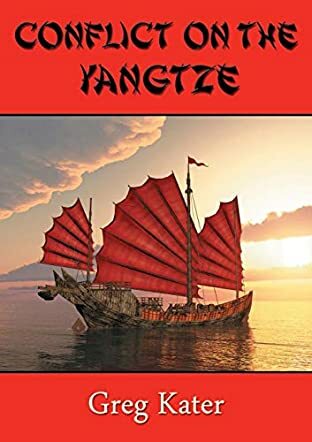 Conflict on the Yangtze by Greg Kater is a historical novel featuring compelling characters already introduced in the series. Jamie Munro and Jack O'Brian are operatives working for the Commonwealth Investigative Office in Darwin and now they are sent on a mission to investigate the murder of one of their own. Going through Manila to enter Shanghai, what awaits them is mayhem, a world where men survive through force and cunning. They are embroiled in a world where gangs compete for notoriety, but most importantly, they must deal with a ruthless cartel. Can they navigate this dangerous environment and unearth the truth or will they sink this time? The narrative is done in a strong and enticing voice. It features compelling characters and after reading the previous books in this series, I was looking forward for the author to up the game. As usual, he never disappointed. Character development is top notch. While the characters have to navigate through tough and dangerous situations, they still manage to keep the humor - at times grim - and readers will enjoy the connection between the two lead characters. The narrative is littered with historical references, allowing readers a powerful feel of China during the Second World War. The book is filled with action and moments that are exhilarating. Greg Kater is a great storyteller with economy of word, a unique phraseology and the ability to craft beautiful and engaging dialogues. This book is fast paced and filled with entertainment. Author Greg Kater brings us an Asia-based action adventure with his latest novel, Conflict on the Yangtze. Featuring many of the characters already introduced in his previous works, the author takes us on a journey up the famous Yangtze River in post-war China to attempt to destroy an opium smuggling ring flooding Australia and the U.S. with illicit drugs, transported via the Philippines. Jamie Munro and half-aborigine Jack “Jacko” O’Brien, from the Australian Commonwealth Investigation Services, will team up with Colonel John Cook from Britain’s MI6 and Harry Williams from the U.S. Office of Strategic Services to try to destroy the smuggling ring. Entering a China wracked with virtual civil war, as Mao’s Communists battle with Chiang Kai Shek’s Kuomintang Government, was always going to be fraught with danger for the pair, especially with various warlords also struggling for control of a country left in a vacuum with the defeat of the Japanese invaders. Fortunately for Munro and O’Brien they have a secret weapon – Jacko’s diminutive but incredibly brave and resourceful half-sister, the Aborigine girl Sarah. Together they will tackle the drug cartel from production to transport to distribution. Conflict on the Yangtze reads very much like a “Boys Own” adventure story from my childhood, with action and excitement on almost every page. Author Greg Kater has a direct and engaging style of writing that draws the reader into the familial group of characters and imbues them with a sense that they belong to the reader. As a New Zealander, I appreciated the sometimes not so subtle “Aussie” speak and references, but I imagine for many readers an “Aussie” glossary would be a useful tool for this book. Undoubtedly the stars of the show were none of the big brave Intelligence officers but rather the tiny Aboriginal girl, Sarah. Her resourcefulness and her charming humility were beautifully portrayed by the author and one was totally endeared to her by the end of the story. This is a continuation of characters previously introduced by Kater but one does not have to have read his earlier books to be enthralled by this one – it stands alone, as a wonderful story. If you are a lover of action/adventure with a very ethnic twist or a lover of historical fiction (as I am) this book will be right up your alley. I thoroughly enjoyed this book and can highly recommend it.